Victor Oladipo made four 3-pointers and scored 24 points. 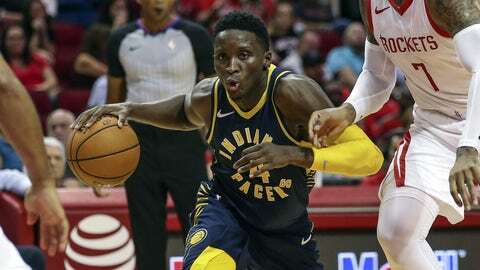 Victor Oladipo made four 3-pointers and scored 24 points, Domantas Sabonis had 15 points and 12 rebounds, and the Indiana Pacers beat the Houston Rockets 110-100 on Thursday night in their preseason opener. TJ Leaf, starting in place of Thaddeus Young, had 13 points and 12 rebounds. Reigning NBA MVP James Harden had 17 points and 10 assists in Houston’s first home game. Carmelo Anthony added 16 points. Indiana went into halftime with some momentum after Leaf blocked Chris Paul’s 3-pointer and Oladipo banked in a 3-pointer just before the buzzer for a 54-48 lead. The Pacers also beat the third-quarter buzzer when Bojan Bogdanovic took an inbounds pass with 0.7 seconds left and sank a 3-pointer for an 83-82 lead. PACERS: Young (11.8 points, 6.3 rebounds) is one of five returning starters from a 48-win team that took the eventual Eastern Conference champion Cleveland Cavaliers to seven games in the first round of the playoffs. … Newcomer Doug McDermott scored two points in a team-high 36 minutes and second-year guard Edmond Sumner had 13 points in 19 minutes. … All four of Indiana’s preseason games, played every other day, will be on the road. ROCKETS: Michael Carter-Williams scored 15 points, with several dunks, and pulled Houston to 106-100 with 1:11 left but Indiana made four straight free throws to seal it. … Paul had six points, four rebounds and five assists in 29 minutes. … Houston was 15 of 40 from 3-point range, led by Anthony’s four makes. UP NEXT: Indiana (1-0) plays at Memphis on Saturday. Houston (1-1) plays at San Antonio on Sunday.